There are two reasons why you should know just where you are on your biological clock. The first is that you can plan your life better if you know when you need to worry. The second is that if you find you do not have much time left, you can actually have your eggs (or even one of your ovaries) retrieved and frozen for later use. Thus, despite the otherwise inexorable ticking of your biological clock (the major cause of infertility in the modern era), you can now preserve your fertility for when you are truly ready to have a baby. Although embryo freezing has been around for decades, up until recently egg freezing has been very problematic. Now, however, if tests show that you will lose your fertility early in life, you can actually do something about it other than just having a baby before you really wish to have one. You can now successfully have your eggs frozen, or even one of your ovaries. This is briefly how it works [see technical video]: 70 percent of the human body is water. The only reason we cannot freeze living organisms (like us) and hold them in suspended animation indefinitely is that the water in our cells would become ice, which crystallizes and expands and would destroy the integrity of every cell (just like a bottle of milk in a freezer would break). That is how freezing to death occurs. But if we can avoid that formation of ice crystals inside the cells, then lowering the temperature to -196 degrees Celsius just suspends all metabolic processes, and can do so indefinitely without harm. Individual cells (like white blood cells and embryos) for decades could be frozen quite successfully on a routine basis by a process called “slow freeze,” in which the water content of the cell is removed and antifreeze solution (like in your car’s radiator) replaces it. There are three components of this slow-freeze process. A cryoprotectant antifreeze solution contains sucrose, a sugar that osmotically pulls water out of the cell. At the same time the antifreeze solution itself (either dimethylsulfoxide [DMSO] or propylene glycol) penetrates into the cell just like in your car’s radiator. Finally, this antifreeze solution, which contains the embryos, is placed in a computer-controlled freezing machine that lowers the temperature slowly (-0.3 degrees Celsius per minute). That way, as ice crystals form preferentially outside of the cell, the concentration of solutes increases on the outside, gradually drawing more and more water out of the cell by increasing osmotic pressure. Thus, by using these three separate processes, the embryo can be more or less freeze-dried, usually without harm. However, eggs have rarely survived this slow-freeze technique that worked so well for embryos in IVF patients and for stem cells in cancer patients. The reason is that mature eggs have their chromosomes lined up very precisely on a delicate platelike structure called the spindle, and are therefore much more sensitive to temperature drops. A cell that has completed cell division (with a discernible nucleus) has its DNA in a much more stable arrangement than either a mature egg or any cell in the process of dividing. Therefore, the slightest residual intracellular ice formation can kill the mature egg, even though it does not kill an embryo. A new technique called “vitrification” (perfected by our partners at the Kato Clinic in Japan) avoids this damage not by trying to pull every molecule of water out of the cell, but by using such a super-high concentration of antifreeze that the water inside the cell never becomes ice no matter how low the temperature. This is a rapid technique that completely avoids the use of a slow-freezing machine. Most important, because the temperature drops so quickly and no intracellular ice at all is allowed to form, this technique finally makes freezing of eggs a viable way to preserve fertility. The specific procedure was developed in Japan, and thus far is yielding remarkably good results. So we can now readily freeze your biological clock and save your eggs for when you are finally ready to have children. However, there is another approach which some women may prefer to egg freezing. 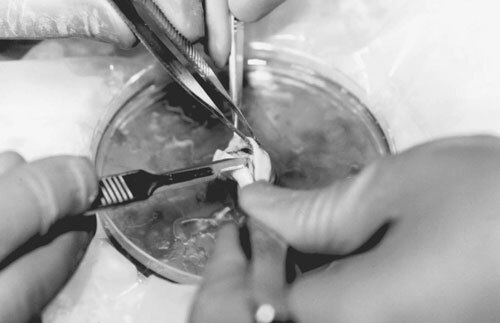 An entire ovary can also be preserved, an approach that may even surpass egg freezing in efficacy. The reason for the poor success of egg freezing in the past is that the eggs retrieved through normal IVF-type processes are undergoing chromosomal division. The chromosomes of retrieved eggs are highly organized on a complex spindle, which is very susceptible to minor crystal damage from freezing. However, “resting” eggs in primordial follicles within an unstimulated ovary are undergoing minimal cellular activity and have no such complex spindle formation. Therefore, these immature, resting eggs are not easily damaged during an appropriately administered freezing procedure. Furthermore, all these resting eggs, called “primordial follicles,” are located in the thin outer one-millimeter crust of the ovary. Thus, we can remove an entire ovary, perform bench microsurgery to remove the inside (to allow successful diffusion of the cryo protectant into the outer crust), and then successfully freeze this ovarian tissue in the same way we have been freezing embryos for decades (see Fig. 1). The frozen ovary can be stored safely for many years, and then can be transplanted back and function normally. FIGURE 1: An ovary being prepared for freezing and preservation from a young woman about to undergo radiation and chemotherapy for cancer. This technology can be used not only to preserve a woman’s declining fertility until she is finally ready to have a baby, but also to prevent young cancer patients from becoming sterile as a result of chemotherapy and radiation. We can actually take out a cancer patient’s entire ovary and freeze it for grafting back later, or we can retrieve and freeze her individual eggs, before she receives otherwise sterilizing chemotherapy or radiation.